A small investment of Rs. 10,000 a month over a period of 10 years can help you create a corpus of Rs. 25 lakhs. Total amount invested over period of 10 years by you will be Rs. 12 lakhs and you will have profit of Rs. 13 lakhs. Not Good? This might look less to you as we are assuming returns of 13.5% per annum. If we assume returns of 27% per annum, your corpus will be Rs. 50 lakh and your profits would be more than 3 times of your actual investments that too when you are investing a nominal amount of Rs. 10,000 on monthly basis. Impressive! Right? You might think that investing in mutual funds could be one of the way to start SIP (Systematic Investment Plan). However, returns may not be that high which you can generate by directly investing into good quality small and mid cap stocks. Hence, we suggest our members to start SIP by directly investing in stocks every month. What you are suppose to do is to invest your savings in a particular stock once in a month instead of putting it into mutual fund. Next month, same amount would be invested in another stock which at that point of time gives you good medium to long term investment opportunity. This could be an ideal choice for salaried employees as well as businessmen / entrepreneurs, as it will help you to directly invest in fundamentally strong small and mid cap companies to build a diversified portfolio of high quality small and mid cap stocks over a period of time to achieve wealth creation. Investing in stocks is a great way to build your diversified investment portfolio. It is a simple and time tested approach for accumulation of wealth in a disciplined manner. Simply get some savings from your monthly income and invest in equities for long term. It not only allows you to save every month in a disciplined way but also help you ride through ups and downs of stock market. Invest some portion of your monthly income in good companies without timing the stock market and you will definitely get rewarded in long run. 1. Invest in stock market with a long term view (3 - 7 years or more). 2. Invest in companies which are fundamentally strong with scalable business. 3. Follow disciplined approach by Investing regularly in equities. 4. Build a diversified portfolio by investing in small & mid cap companies. 5. Avoid frequent buying / selling of stocks, Its trading not Investing! 6. Review performance of your holding companies at least once a year to decide whether to buy / sell or hold. It gives us immense pleasure to share that average returns of Saral Gyan 52 Hidden Gems stocks (Our Unexplored Multibagger Small Caps) released since inception (from Sept 2010 to Dec 2015) during last 5 years is 199.2% compared to 27.9% returns of BSE Small Cap Index. Investment of Rs. 10,000 in Hidden Gems till Dec'15 during last 5 years not only allowed you to save Rs. 5.2 lakh but also appreciated your investment by almost 2 times making your total Hidden Gems stocks portfolio of Rs. 15.56 lakh with overall profit of Rs. 10.36 lakh. However, if you would have invested the same amount in Small Cap index, you would be sitting with overall gains of Rs. 1.65 lakh. If we look at past performance from Sept 2010 till Dec 2015, Hidden Gems SIP stocks have given annualized returns of almost 40%. Below is the Hidden Gems performance scorecard (since inception - from Sept 2010 to Dec 2015) which illustrates value of Rs. 10,000 invested every month in Hidden Gem (Unexplored Multibagger Small Cap Stocks) stock of the month vis a vis value of Rs. 10,000 invested in BSE Small Cap Index during last 5 years as on 31st March'16. We are glad to inform you that 33 Hidden Gems stocks out of 52 during last 5 years have given more than 100% returns to our members. 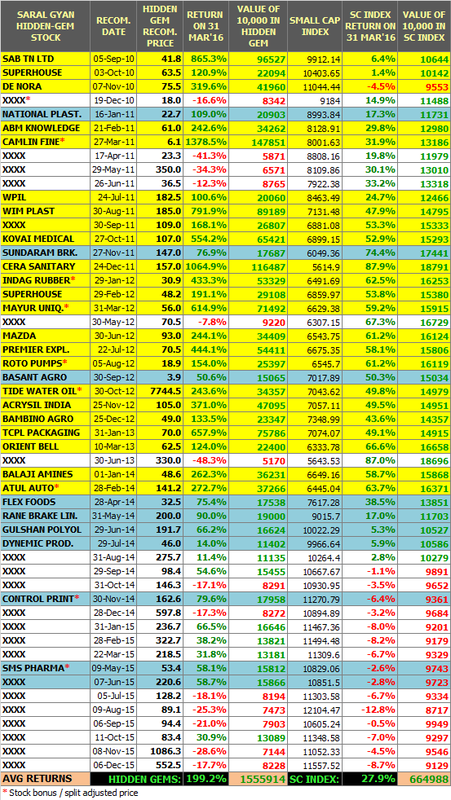 Moreover, 22 stocks out of these 33 have given returns in the range of 200% to 1900%. Note: Total 52 Hidden Gems stocks were released during last 64 months, we have not released Hidden Gems for the months not displayed in the scorecard above. We also suggested our members, which earlier recommended Hidden Gems stocks can be added more in their portfolio based on company's strong fundamentals. Ex: Mayur Uniquoter, Cera Sanitaryware, Wim Plast, Camlin Fine Chemicals, Acrysil, Kovai Medical, Superhouse, De Nora and Control Print were some of the stocks which we recommended to our members to accumulate later at much higher price from our initial recommended price. Now profits can be seen as these stocks have given multibagger returns. Through Hidden Gems and Value Picks, we are providing you opportunities to invest in such small / mid cap stocks today. Infosys, Pantaloon, Dabur, Glenmark were the small cap stocks in past and today are the well known companies falling under mid and large cap space. The stocks we reveal through Hidden Gems & Value Picks are companies that are either under-researched or not covered by other brokers and research firms. We keep on updating our subscribers on our past recommendations suggesting them whether to hold / buy or sell stocks on the basis of company's performance and future growth outlook. Time has shown that smart investors have made their fortune by investing in equities in long term. None other asset class can match giving you such extra ordinary returns. Yes, its important for you to invest in right set of companies at right price with medium to long term perspective. If you think to invest in stocks for period of 3 months or 6 months, we suggest you to stay out of stock market because you are not investing, you are betting on volatility of stock market which could be risky. Add power to your equity portfolio by investing in high quality small & mid cap stocks - Hidden Gems & Value Picks. Enjoy great savings and receive valuable freebies during Saral Gyan Holi Dhamaka Offer 2016 by availing subscription of our Hidden Gems, Value Picks & Wealth-Builder services.